What if installing more solar could reduce electricity prices? It’s already happening in Germany, world leader in solar power, and it’s likely to happen in the U.S., too. Test Case: Can Cash Payments Win Over Locals to Wind Project? 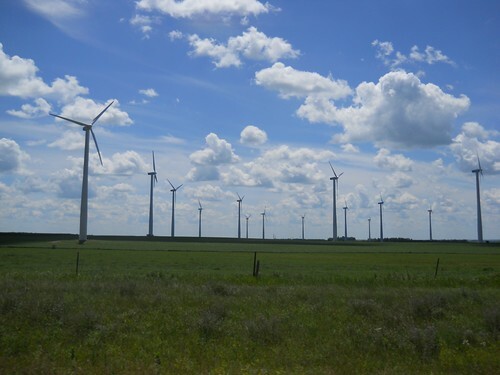 A 50-turbine wind farm in Goodhue County in southeastern Minnesota has met with stiff local resistance, a frequent tale in the wind industry. Recently, the project developer won a key court case to move forward, after making concessions about the distance (“setback”) between the wind farm and local homes. However, many residents remained unconvinced that the project was in their best interest. But today the project developers offered $10,000 payments (over 20 years) to about 200 local residents to try to win them over. The concept might work, although the payments – $500 per year – aren’t particularly large. In a recent European study, researchers found that citizens generally have two priorities for renewable energy projects: avoiding environmental and personal harm and sharing in the economic benefits from their local energy resources. The $10,000 checks could go a long way toward satisfying local residents that they aren’t being simply colonized for their wind resource. The wind project had already been certified as “community-based” under a 2005 state statute, but local opponents contested that a wind farm development by a company owned by Texas oilman T. Boone Pickens hardly qualified. It remains to be seen whether a more significant a direct benefit for nearby residents is enough to buy their support. Could California Save 30% or More on Solar With German Policy? The Golden State has covered over 50,000 roofs with solar PV in the past decade, but could it also save 30% or more on its current solar costs? Renewable energy guru Paul Gipe wrote up a study last week that found that Californians pay much more per kilowatt-hour of solar power than Germans do (accounting for the difference in the solar resource). 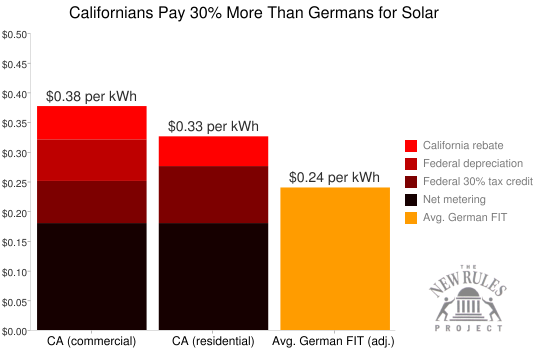 The following chart outlines the various ways Californians pay for solar, compared to the Germans (averaged over 20 years, per kilowatt-hour produced). 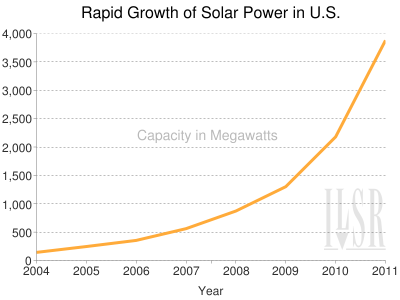 The inefficiency of federal tax credits artificially inflates the cost of U.S. solar. Big banks that offer financing for residential solar leasing routinely overstate the value of the systems, increasing taxpayer costs on otherwise cost-effective systems. The complexity and intricacy of the state and federal incentives (4 separate pots of money!) and the lack of guaranteed interconnection means higher risk and higher cost for U.S. solar projects. The inconsistency in local permitting standards that increases project overhead costs. Ultimately, the combination of these market-dampening problems in the California market has hindered the cost savings that have hit the German market. California solar installations of 25 kilowatts (kW) and 100 kW have a quoted price of $4.36 and $3.84 per Watt, respectively, according to the Clean Coalition. This compares to $3.40 per Watt on average for already installed projects of 10-100 kW in Germany. Given a solar cost disadvantage that is present both in the value of incentives AND in the actual installed cost, renewable energy advocates in California should seriously question whether the current policy framework makes sense. The mish-mash of federal tax credits and state/utility rebates has not led to the same economies of scale and market maturity as Germany has accomplished with their CLEAN contract (a.k.a. feed-in tariff). Switching energy policies could save ratepayers billions. A 24-cent CLEAN contract price for California solar (to match the German contract) would replace the entire slate of existing solar incentives with an overall average cost 30% lower than the current combined incentives. If 2011 is a banner year and the state sees 1 gigawatt (GW) of installed capacity, the savings to ratepayers of a CLEAN program (over 20 years) would be nearly $3 billion. If the CLEAN price were adjusted down to assume that projects could use the federal tax credit, then California could set the contract price as low as 18.5 cents per kWh, 5 cents less than is currently paid by California ratepayers (although requiring projects to use tax credits has significant liabilities). Several states and municipal utilities (Vermont; Gainesville, FL; San Antonio, TX) have already shifted to this simple, comprehensive policy, with promising early results. Californians should consider whether holding to an outdated and complicated energy policy is worth paying billions of dollars extra for solar power. 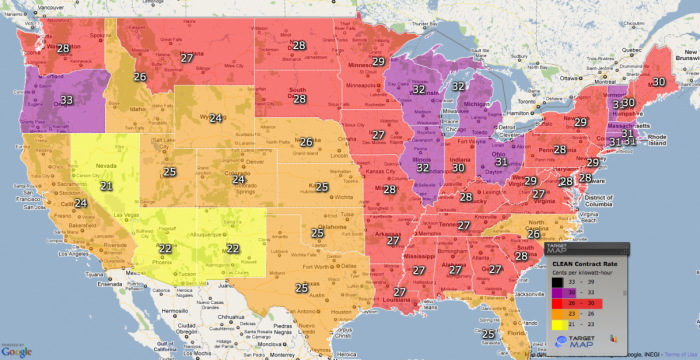 Pricing CLEAN Contracts – feed-in tariffs – for Solar PV in the U.S. The price of solar is dropping fast, opening new opportunities for community-scale renewable energy across the country. But despite the improving economics and tremendously sunnier skies, the United States lags far behind Germany in installing new solar power. What might happen if the U.S. adopted Germany’s flagship “feed-in tariff” policy, responsible for 10 gigawatts of solar in just two years? Let’s take a look at how such a program would be priced. First, we’re marketing conscious in America, so we’ll call it something better, like a CLEAN contract, for Clean Local Energy Accessible Now. 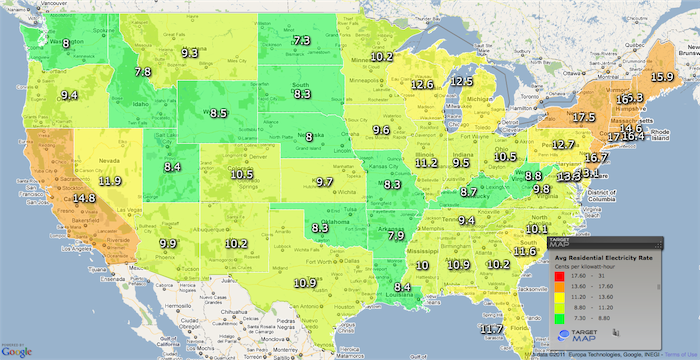 So, solar is narrowing the gap with retail grid electricity rates. The Germans pay these rates to anyone who can put up a solar panel, per kilowatt-hour sent to the grid, for 20 years. These rates may seem high, but we’re just getting started. Next, we have to adjust these rates down to account for the significantly better sunshine in the U.S. For illustration, Albany (NY) has 33% better sunshine than Munich (Germany), even though Munich is in the “sunny south” of Germany. Los Angeles gets almost 70% better sunshine than Munich. 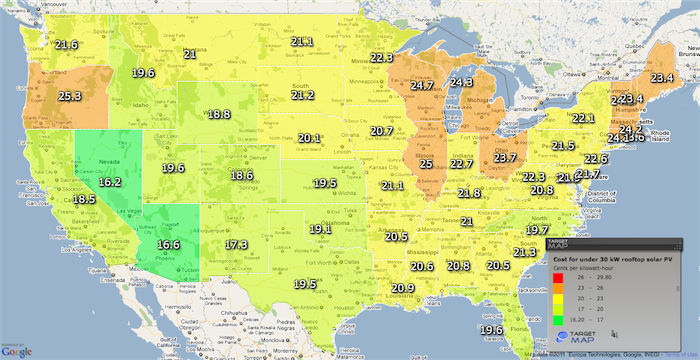 We’ll pick St. Louis, MO, for its central location and average U.S. solar resource. The following table illustrates the dramatic drop in the price required to offer a modest return on investment for a rooftop solar project. 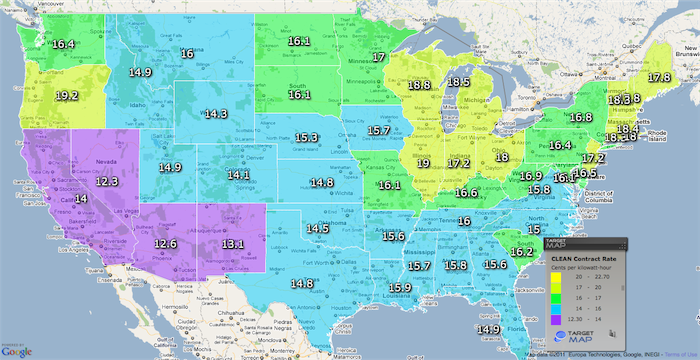 The following map provides a look at the prices for a CLEAN contract for rooftop solar PV (< 30 kW) in each state, based on one of the state’s sunnier locations (click here for an interactive version). Prices would be up to 25% lower for the largest PV projects (over 1 MW). 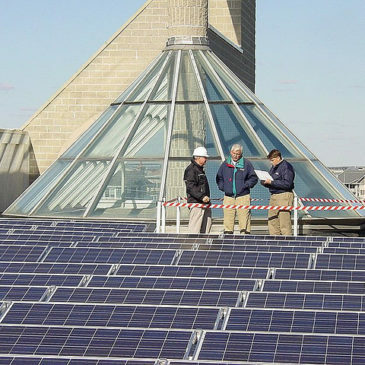 In many cases, commercial developers of PV can claim accelerated depreciation in addition to the federal 30% tax credit. With this additional discount (worth around 20% of the project cost), the cost of a CLEAN contract falls even further, as shown on the map (click here for an interactive version). Once again, prices would be up to 25% lower for PV projects 1 MW and larger. 1) Many individuals and entities (e.g. schools, cities, nonprofits) can’t effectively use a tax credit incentive. 2) Tax incentive programs expire or are killed by “budget hawks” (or ideologues) in Congress. The 30% federal investment tax credit for solar is in statute until 2016, but let’s assume for a moment that it expired or that we want to look at the CLEAN contract rates for projects not able to use any federal incentives for solar power. 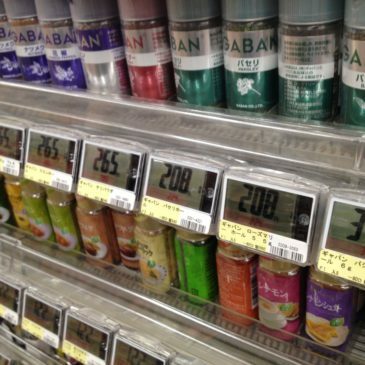 We still assume an installed cost of $3.50 per Watt. 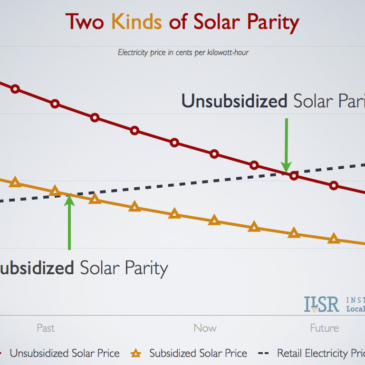 This chart is a more accurate representation of the state of solar economics (without incentives). It’s also the price required for the most democratic solar incentive program, one that would not be prejudiced against participants who couldn’t effectively use the federal tax incentives. In the end, a CLEAN program in the U.S. will likely be premised on the use of one or both federal tax incentives and pay much less than this last chart. It will make sense for ratepayers, but will probably not have the same democratizing effect as Germany’s flagship program.